This week on Earthgauge, I present a feature interview with the Ottawa Riverkeeper, Meredith Brown and we talk climate science with Eric Galbraith of McGill University. Click the audio player above or right click here to download the show. First up….it’s Climate Change 101! Ever want to know about some of the fundamentals of climate science so you can easily refute that climate change denying buddy of yours? Well, we have a Climate Change 101 session with Eric Galbraith of McGill University. He is a Professor of Earth and Planetary Science and he’ll explain just why it is there is virtually no disagreement among climate scientists that the planet is warming and humans are to blame. Additional resources that provide excellent information on the fundamentals of climate science include www.skepticalscience.com, www.livescience.com, and www.thinkprogress.org. Later on the show, I speak with the Ottawa Riverkeeper Meredith Brown. Founded in 2001, Ottawa Riverkeeper is an independent voice for the Ottawa River, providing leadership and inspiration to protect, promote and improve its ecological health and future. The organization works collaboratively to inspire others to take action, to encourage responsible decision making, to hold polluters accountable and to recommend alternative practices and policies to safeguard our local waterways. Ottawa Riverkeeper is a member of Waterkeeper Alliance, an international grassroots organization founded by Robert F. Kennedy Jr.
Meredith Brown is a strong science-based voice for the Ottawa River, acting as its full-time “watchdog”. Since 2004, Meredith has significantly raised the profile of the Ottawa River and brought important issues such as sewage dumping and radioactive waste to the attention of the public and decision-makers. In our interview, we discuss the health of the Ottawa River, changes to federal environmental regulations, the Wild and Scenic Film Festival and the Ottawa River Action Plan. Of course we also have our usual update from Kathy of Ecology Ottawa on local environmental events and campaigns. First on the show we talk organic food: The last ten years have seen a phenomenal explosion in the organic food movement as it has moved from niche market to main stream. Today, it is the fastest growing segment of the food industry attracting all of the major food corporations. This coming Saturday kicks off Canada’s National Organic Week so we catch up with Stephanie Lane of Canadian Organic Growers (Ottawa chapter) to talk about National Organic Week and find out why organic food is better for the planet, for farm workers and for you. David Koch also comes into the studio to tell us about how the brutally hot and dry summer drought here in the Ottawa region impacted farmers Ottawa region. Is this a sign of things to come in a changing global climate? And finally we talk to Lyn Adamson about the Fast and Vigil for Climate Justice taking place on Parliament Hill from September 21-October 2. On tomorrow’s show, we’re taking a look at the recently concluded Rio +20 Earth Summit and discussing the increasing problem of the Emerald Ash Borer beetle in Ottawa. Earthgauge Radio can be heard every Thursday on CKCU radio 93.1 FM in Ottawa or online at http://www.ckcufm.com. You can also download the podcast right here on earthgauge.ca. The Rio Summit was of course a huge international United Nations meeting that came on the 20th anniversary of the original Rio Earth Summit back in 1992. And how things have changed since then. 50,000 participants from governments, the private sector, NGOs and other groups came together from June 20-22 to try to shape how we can reduce poverty, advance social equity and ensure environmental protection on an ever more crowded planet to get to the future we want. And this was in fact the slogan for the Summit: The Future We Want. However, expectations for the summit were quite low and many feel that Rio +20 accomplished very little. We’ll take a closer look at what happened in Rio first up on tomorrow’s show. Also on the program we’ll be discussing Ottawa’s Emerald Ash Borer beetle infestation with Meg Sears, who is an Environmental Health advocate and Sean Barker of the Eastern Ontario Arborists. They’ll both join me in the studio around 7:30 or so to discuss the increasing problem of the Emerald Ash Borer. This is a beetle that is originally from northeastern Asia but has been causing havoc in North America since its arrival in 2002. The beetle has had a devastating impact in the decade since, spreading across 14 US states, southern Ontario, and now the Ottawa Valley and Eastern Townships, killing at least 10 million trees. It has now been unleashed in Ottawa so we’ll find out just what the city is doing about it and what needs to be done. For years now, scientists have been trying to figure out why so many bees have been disappearing around the world. In what’s become known as colony collapse disorder (CCD), entire colonies have vanished in unprecedented numbers. 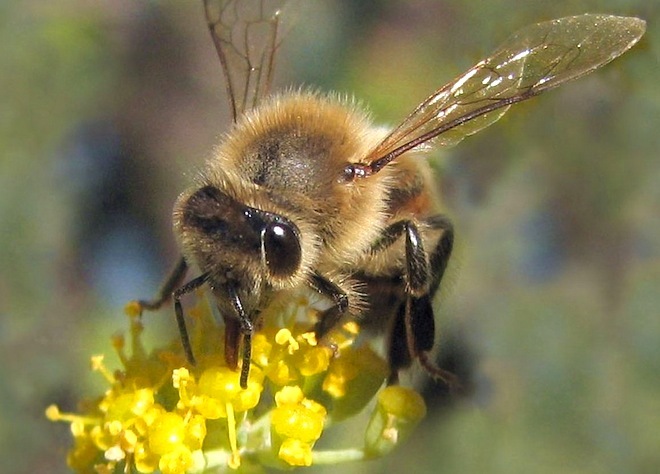 Now new research suggests that, surprise surprise, it may our profligate use of potent pesticides that is causing the collapse of bee populations. A controversial type of pesticide appears to scramble bees’ sense of direction, making it hard for them to find home. Starved of foragers and the pollen they carry, colonies produce fewer queens, and eventually collapse. The phenomenon is described in two new studies published March 29 in Science. Researchers say there is an “urgent need” to re-evaluate the safety of the pesticides, known as neonicotinoids, and do followup studies in this country where some bumblebees are teetering on extinction.